woah!!!! this is interesting,my god where on earth had that bike been hiding? Hi Peter ,excuse my ignorant i'm Ray Feltell eldest son,i do have a photo which is newspaper cliping in black and white and it very grainy quality pic , i will get it up here as soon i get new scanner,in the meantime and can give you a little detail it was built in year around 1976 as self fund outgoing to racing,then in 1977 he was sponsored by Copes (car and bike dealer from Warley) at the first meeting of the year at the pod my dad had mixed fortune on his 875cc Morgo Triumph,his pleasure was winning the senior bike elimination as he crossed the line,soon changed as he got into a wobble being thrown down the track as the bike went out of control,i think that when he broke his collar bone and was kept in at a local hospital.He beat gary norman on that final run with a time of 10.20s/133mph. Do you have any info or history as where the frame had been?it nice to know it still around. Hi Ian, Good to talk to you, What a result !! The story of the bike is that it was bought with a standard looking Triumph engine and box ( which had quite obviously never been fitted to it) by a part time dealer i know in Northumberland from the widow of the orevious owner. It looked a bit of a mess, certainly not been run for many years, if at all since it left your family. Knowing that i competed in Drag racing he offered it to me and i went up and bought it a couple of weeks ago. The frame cleaned up nicely and looks beautifully made, all the paint has now been stripped off ( ive left the seat painted for old times sake) , but i had no idea of its history or even what engine it had been raced with. It appears to have had the chain running down the right hand side which had me wondering, perhaps when i see a photo all will be made clear. I regularly look on 200mph website drag section and put a post on there, through Keith Parnell i found that this was your fathers race number and i searched through Accleration Archive etc but only found photos of earlier "Penetrations". Anything you can tell me about the bikes history would be good, who made the frame , any engine specs, times recorded, who it was sold to etc ???. I also have something else of interest that i picked up at an Autojumble and can now probably use on this bike, i will start a new thread for that. If you want to send me any photos etc probably easiest to send direct to me at yorkshirerallyspares@btinternet.com it saves having to reduce the size first and might come through as better quality. One other interesting point, the bike still carries a large grind mark on the right hand side of the top yoke and a similar scuff on the seat as a result of the off at Santa Pod. 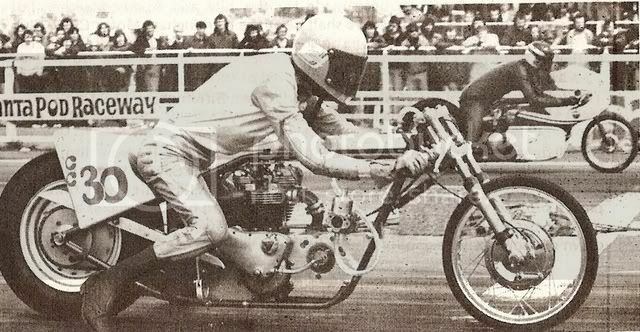 At the moment Peter photos are very few and hard to find of Ray’s old Triumph Bike but I have found this one from Santa Pod in 1975. A bit grainy but it may help.